This was the first clue from Ben & Jerry's facebook page on 10/22. I think everyone's general thought was that there had to be some kind of nut in here because 1) squirrel! and 2) it looks like some kind of nut cluster thing inside the pint. The squirrel is really a reference to the skiing swirl seen in anchorman. All I can say is.... well played Ben & Jerry. Anyway, the clues piled in but it wasn't until the last photo that I realized what was going on. I did some digging to double check my answer and everything seemed to be lining up. So, we had some fun over on our facebook page as we counted down to the 5 pm announcement. Before I go, can I nitpick for a sec? Why aren't there three butterscotch components to match the three scotches in the name. 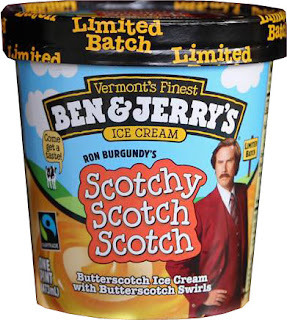 Don't get me wrong, I'm glad Ben & Jerry's has given this a silly name, I just don't know why they didn't bother to add some kind of butterscotch cookie, chunk, or chip to really seal the deal. Anyway, stay tuned while Nick and I search high and low to bring you guys this new flavor. We want our Candy Bar Pie pints already! Come on Ben and Jerry's! I can't wait to try this butterscotch flavor. I dig a new profile whenever I can get it! 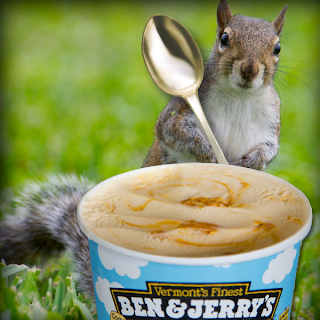 Like you, the squirrel threw me :( and I also wish there was a third butterscotch component. I'm surprised they didn't also add butterscotch chips. B&J's are big on the add ins but that probably would have been too much. They should have thrown some oatmeal cookies in there! @Anon: That was my thoughts exactly. Some oatmeal scotchies would've been awesome and added a third butterscotch component! They already do butterscotch toffee flakes for Rockin Blondies. They should have just added those. They probably left out the crunch to match the liquid scotch smoothness they're obviously referencing. @Josh: I get where you're coming from but wouldn't they have incorporated real scotch into the ice cream to get that emulation as well?